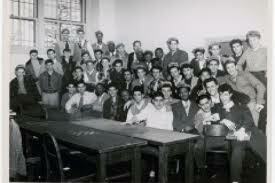 Large classes of 50-plus students were common in early 20th century schools, especially in cities. Class size fell throughout the past century to around 30 students in elementary and secondary classrooms, dipping to 25 and rising to 35 in times of budgetary retrenchment. Beginning in the 1980s, state efforts to reduce class size to 20 students or less per classroom, especially in primary grades, led legislatures to fund smaller class size in order to lift student achievement. Research studies had established that smaller class sizes (numbers varied in these studies from 15 to 25 student) produced gains in test scores. For example, in the Tennessee experiments in reduced class size in elementary schools—a small class was 13-17 students; a large class was 22-26 students—achievement test score gains did occur especially for low-income and minority children in primary grades. Most reduced-class size efforts before and after these studies, however, seldom reached the 13-17 students per teacher that Tennessee had created (Tennessee study five year follow-up). The theory was that small class size would permit teachers to engage students more fully, use particular classroom practices such as small group and individual instruction more easily, and, as a consequence student academic performance on tests would improve. The theory had a few holes in it. Researchers examined one of the largest efforts to cut class size in California in the mid-1990s. The state legislature invested $1 billion to downsize primary grade classes of around 30 students to about 20. Parents, teachers, and school boards applauded the effort and sang the praises of the legislature and governor. Note, however, that California created classes that were close to the “large” ones in the Tennessee experiment. “We tracked achievement gains in cohorts of students with different amounts of exposure to CSR [class size reduction] from kindergarten through third grade. Whether we used statewide average scores or conducted a more refined school-level analysis we reached the same conclusion. We found no association between small differences in exposure to CSR (i.e., the total number of years a student had been in reduced size classes) and differences in academic achievement” (p. 15). “For the most part, teachers in reduced and non-reduced size classes reported using selected instructional activities with equal frequency. In mathematics these activities included using a calculator, using mathematics in the context of other subjects, doing mathematics worksheets, using patterns to discover mathematical relationships, and practicing computational skills. In language arts, the activities included having guided discussion about reading, discussing new or difficult vocabulary, working in a reading book, and listening to the teacher read stories” (p.22). Another researcher examined studies covering U.S. and international efforts to reduce class size since the 1970s, including the Tennessee and California studies noted above. He found very small effects on achievement and little to no change in classroom practices of teachers in “small” and “large” classes (see pp. 403-410). Even with all of the embellished talk from reformers about fundamentally altering classroom teaching, at best, there were only incremental changes in how teachers taught. In short, smaller class sizes even in the range of 20 students in a class does not mean that teachers automatically shift to other forms of teaching. Yet, the fact remains that teachers, by and large, want smaller class size in the 20-25 student range because it is simply easier to manage behavior and differences among students in their motivation to learn, interests, and backgrounds. Teachers report that they can differentiate materials and activities with far less stress than in larger classes. Nonetheless, shifts in teaching practice, say from teacher-directed to student-centered happen infrequently as a result of smaller class size. So, in short, you are implying that class size doesn’t matter where achievement is concerned in public schools. Would that be true of private k-12 schools? Any comparison research on this? Have you read about colleges using computer programs to teach remedial math, and math specific to non-math majors? “At Virginia Tech, Computers Help Solve a Math Class Problem,” http://www.washingtonpost.com/local/education/at-virginia-tech-computers-help-solve-a-math-class-problem/2012/04/22/gIQAmAOmaT_story.html. 200 students in the lab at one time. 3 TAs. Efficiency and economy through technology. Additionally, Virginia has legislated that every student will take one online course before he/she graduates high school. Passed this year, effective 2013, it is an unfunded mandate. It appears class size doesn’t matter in a computer mediated classroom. And here we thought computers would never replace teachers in K-12 schools. Joke is on us. I do not know of research studies on private schools and class size. Thanks for your comment on your own teaching and the workload differences when classes were larger and smaller. I did not know about Virginia legislating that every high school student has to take at least one online course before receiving a diploma. I did know about Idaho’s requirement. I would guess that more states will do similar mandating. Many folks have written about hybrid elementary schools where Learning Labs of an hour or more a day have individual students doing online work; the rest of the day is with teachers in regular classrooms. That model will expand, I believe, with low-income children. I seem to remember reading something about this that said class size didn’t matter anywhere near as much as the quality of the teacher. But I think the study i read about found that class size DID matter with a quality teacher (who probably did vary instruction more, as per your post)–that their students performed better in a smaller class size. However, no matter the size the classroom, students with a lower-quality teacher saw no difference in achievement. Maybe you want to check out the links I provided. My thoughts are drawn back to a recurrent theme in many of Dr. Cuban’s posts: “good vs. successful” educational structures and practices. Since many structures, and practices (class size reduction, student-centered learning, etc.) may not be able to be empirically demonstrated to be successful (in statistically significant, casual relationships), reformers tend to disregard them–for the majority of our country’s public school children. Most people would say that a low student to teacher ratio is a “good” thing. Regardless of what the research says, private schools tout low teacher to student ratios. For $16,770 you can send your son to San Jose’s Bellermine College Prep., which has “an average class size of 25 students.” For $14,750 you can send your daughter to school at Presentation High School in San Jose where she can expect “a 25-to-1 student-teacher ratio, [where] teachers are able to provide personalized attention and support in the classroom….” But since we can not prove that lower class sizes matter, we are simply not willing to provide our neediest children with an educational structure that is valued by affluent parents. Thanks again, Steve, for cutting through a lot of verbiage (including my own) about reduced class size. And thanks for reminding me and readers about the distinction between “good” and “successful” teaching. Thirty-seven in AP lit. Now that is a big class. I have 37 students in my A.P. literature class right now.